In 1894, Étienne-Jules Marey published a pioneering work in scientific photography, Le Mouvement. Marey’s works were a photographic analysis of movement through time and space, depicted with the help of his invention of a ‘camera gun’. The camera gun utilised flash bulbs and multiple exposure to overlay sequential images of movement onto one photographic plate. This drive to ‘picture time’ was not unique to Marey – Edward Muybridge contemporaneously developed a similar system for analysing movement through the use of photography. Unlike Muybridge’s sequential-panel works, that separated images into linear panels (as per the tradition of comic book art), Marey’s works overlaid images on a single plate. Animation is little more than hand-made cinema. Upon completing his studies in painting, O’Carrigan diverted into hand-drawn animation, and for two years exhibited short animations in various artist run spaces and film festivals.2Animators such as O’Carrigan regard the works of Muybridge and Marey as seminal texts to this day – clearly defined figures in motion enabling them to analyse the movement of forms, instilling their drawings with the tension and shifting energies that breathe life into hand-drawn motion. O’Carrigan returned to painting in 2010 with a two-part project, of which this exhibition forms the second half. O’Carrigan’s work across the two exhibitions included in this project, directly references the compositions of Marey. Perhaps it is the monotone of the images that first brings it to the viewer’s attention, but in any case, O’Carrigan is acutely aware of the debt he owes to Marey – compositionally, thematically, and for the contribution to his understanding of movement. The works in this exhibition combine a layered, clustered, and bleak aesthetic – common to all of O’Carrigan’s artistic production to date – while harking back to the scientific approach utilised by Marey. While O’Carrigan has long been interested in an apocalyptic tone,3 his work shifted over time from external Apocalypses (they come in plural these days, it seems), to internal ones. His 2009 post-apocalyptic animation The Petrol Can Rider, examined the fear of stillness, especially within the irony of being trapped in an open space (the tyranny of distance) in a remote Australian environment. By creating a series of frames as he would for an animation, but displaying them on one canvas, O’Carrigan is creating a ‘suspended animation’ that recalls and extends these themes. O’Carrigan’s animation Terminal (shown at Platform 2010)4, marked a dramatic shift to a focus on a sole, figurative, protagonist â€and newly locating the Apocalypse as internal – both a destruction and a revelation of the Cartesian subject. This internal focus of Terminal would, in retrospect, be a clear indicator of O’Carrigan’s shifting interpretation of the Apocalypse – from the external (semi-natural disasters of The Drowned World) to the internal (psychological trauma and involuntary actions). Where the first part of the project watched intended movements go awry, this second part looks instead at movements that, whilst they may or not be of the subject’s own physical volition, are in large part involuntary. A boxer is knocked out on stage – flattened by an external force. The absence of other figures recalls the scene from David Fincher’s Fight Club7 (in which a schizophrenic character beats himself to the ground). The internal drive of subjectivity becomes a nameless external force, disconnected from the subject as in a psychological split. Figures collapse, fall, slip, in each painting. In one, a figure leaps from a cliff face, and yet appears to hold a triumphant body language instead of the desperation of suicide one expects. The viewer is led to infer that, perhaps in this case, too, this movement is in some way involuntary, driven by a force if not physically external, at least external to the figure’s self-determination – a lapse in rational thought, self-control, the instinct for self-preservation a dissociative episode, or a symptom of de-personalisation disorder. Where Marey and Muybridge concentrated on athletic prowess and perfected control of the body, O’Carrigan focuses on failures, physical defeats, relinquishing control, and letting go – whether it is the subject’s intention or not. The figures in O’Carrigan’s works have ‘let go’ of their controls to such extremes, that they are entirely disconnected from any context. This occurs both in their floating figure-ground relationships, (aided by the collaged separation of ink-on-paper figures from the painted surface) and the objective image (devoid of context: a remote and unpeopled setting, if not an entirely black void). There is a tension not only between elements in each canvas, but also in the relationships between the works within this exhibition: having earlier mentioned the cluttered and claustrophobic compositions, it is important to note that some works here offer open vistas or a filmic contrast of fore- and back-ground (the latter also an integral device in hand-drawn animation). This serves to further disconnect the figure-ground relationship: the figures are isolated, floating above the image of which they are part. In one of the ‘falling’ works, a figure (only dimly visible) plummets past the ‘screen’ of the canvas. With no visible background, and no horizon line, we are given no sense of scale or context. We have no way to know how far this figure is going to fall. It is at the moment of viewing this painting, in particular, that the audience realises it is impossible to view a collection of ‘falling figure’ images and not think of the events September 11, 2001. However, the works don’t engage so much with the horrors of the terrorist attacks as with the internal fear of falling: more an allegorical device than a literal examination. Combining the absence of context, with the allusion to September 11, results in a confusing and unsettling juxtaposition. 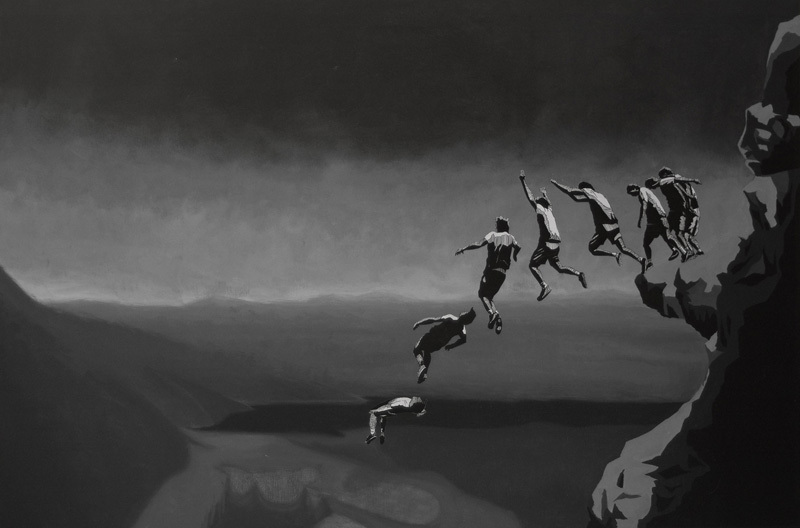 Take, for example, the figure leaping from a cliff in front of a vast vista: rather than portraying an imminent death, it seems to focus in the last two figures of the sequence, on a sense of calm gained within the moment of freefall. A letting go, rather than a (self-) destructive act – perhaps the act is an irrational mind forcing itself to sidestep its fear of stillness. This ‘letting go’ reminds the viewer that the subject is not so much the September 11 attacks as it is the overwhelming overload of information and stimulus of all forms that is pervasive in contemporary times, and the desperate need to find space for ourselves at any cost. The overlapping and obscuring of figures within the compositions was originally inspired, for O’Carrigan, by an accident when compositing an animation.8However, the fact that O’Carrigan then seeks to balance this obfuscation: breathing space into the cramped compositions and opening out the falling figures with the removal of additional detail (or the freedom in the black void). This implies that the psychological and metaphysical concerns of the work are as much of a catalyst for the tense compositions as his background in animation (which brings a purely aesthetic formalism). As a result, the works can be read as a seeking of space within an over-stimulated modern world and the lengths to which we can be driven to achieve that space. Marey and his peers utilised photography to scientifically understand human movement through space and time. O’Carrigan synthesises his understanding of movement, his pictorial sense of space, and his layered collage approach to create allegorical works. Far from a science of motion, they are intended to comprehend the psychic and emotional movement through human consciousness, rather than space and time. His are images both attacking and retreating from the black and white (and sometimes all too grey) modern world, its overloaded stimulus, and its ever-advancing minute hand. 2. These included Be Famous & Die, City Museum, Melbourne, 2008; The Petrol Can Rider, Bus Gallery, 2009; Terminal, Platform, 2009; The Bear Cycle, Seventh, 2009. These works also screened in the Melbourne International Animation Festival, 2008 & 2009, and the St Kilda Film Festival, 2010, among other festivals. 3. An overview of this trajectory in his work can be viewed in summary in an article at <http://www.ballardian.com/simon-ocarrigan-drowned-world>, accessed 11/10/2010. 5. Persistence of Vision – Part One, Simon O’Carrigan, c3 Contemporary Art Space, Abbotsford Convent, 1 St Heliers Street, Abbotsford, VIC. 21 July – 8 August, 2010. < http://c3artspace.blogspot.com/2010/07/exhibition-number-24.html> accessed 12/10/2010. 6. Quote from the artist, taken from ‘New Work Friday’, The Art Life, <www.theartlife.com.au>, published 22/10/2010, accessed 22/10/2010. 7. Fincher, David (dir.). Fight Club. (1999). Adapted for the screen from Chuck Palahniuk’s novel of the same name. 8. E-mail interview with the artist, 2/10/2010. O'Carrigan described aligning hundreds of animation frames in sequence, then accidentally ‘condensing’ the software’s timeline, resulting in an image of thirty seconds worth of figures overlaid in one twelfth of a second. He says it made him realise he could experiment with that effect inside his drawn and painted works.